Our pets struggle to keep cool during the hot summer months, and overheating can cause serious health issues—for example, heat stroke can lead to organ failure or even death if it’s not treated quickly. With that in mind, here are some tips for keeping pets safe when the weather gets warm. Never leave your pet in the car on sunny, summer days. Even with a window cracked on a 70 degree day, the interior of your car can reach 100 degrees in as little as 20 minutes. Do not over-exercise your pet. Outdoor activity is more taxing on your pet’s body when it’s hot outside. Hot asphalt will scorch your pet’s paws. Before you head out for a walk, put your own palm on the pavement—if it’s too hot for you, it’s too hot for your pooch. 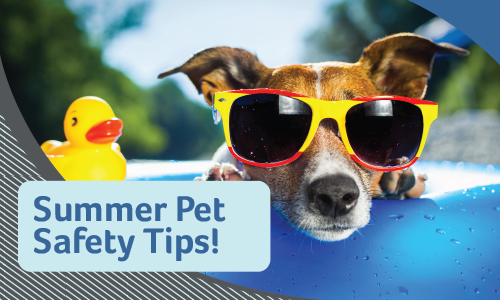 When possible, keep your pet indoors in cool, air-conditioned areas. If your pet has to be outdoors, provide a nice, comfortable source of shade. Always make sure your pet has plenty of fresh water. Remember to constantly replace their water every couple of hours to make sure it stays cool. Symptoms of overheating include excessive panting, increased heart rate and drooling, which can quickly advance to seizures, collapsing, vomiting and bloody diarrhea. If your pet exhibits any of these symptoms, contact us immediately.